Background: Green tea has been consumed for thousands of years, and has been known to have many medicinal properties such as, anti-cancerous, anti-atherogenic, anti-oxidative, antiinflammatory and anti-bacterial. With the increasing prevalence of Cardiovascular Disease (CVD), and its major risk factor, obesity, there has been increasing interest in green tea as a potential antiobesity therapy. Evidence has demonstrated that green tea decreases body weight. However, it remains unclear through which pathway and mechanism green tea exerts its anti-obesity properties. The metabolic adipose tissue hormones, adipocytokines, leptin and adiponectin have been studied extensively as a potential target for green tea and its main catechin, Epigallacatechin Gallate (EGCG). Conclusion: It has been demonstrated that green tea consumption decreases leptin levels which may directly decrease body weight through increasing energy expenditure and fat oxidation. 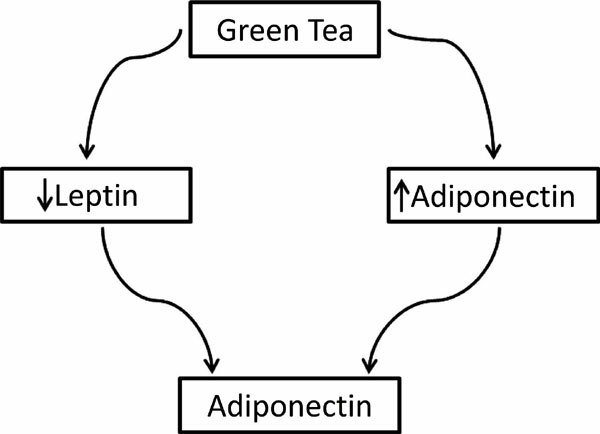 Furthermore, ingestion of green tea or its catechins has been associated with increased adiponectin levels which may indirectly reduce body weight through insulin sensitivity. Green tea, leptin, adiponectin, CVD, obesity, epigallacatechin gallate.